After the astounding weekend I just fleeted from, I think refreshment is in order and I am not finding it at the desk of The Star Press. However I did have two stories run over the weekend. Not on topics that I expect will excite you but hey, I am not exactly in a position to write about everything that I want, yet. One is reflective of father's day and another of strawberry season. The weekend began Thursday night with a slight pause on Friday. 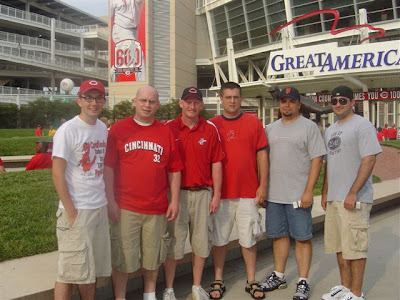 But Thursday night I traveled down old 101 to Cincinnati to see our beloved Reds play the hated Cardinals. I made the trip with my dad but also met friends or I should say colleagues from our Fountain City Baseball League. For those of you unfamiliar, well, who am I kidding no one reads this anyway. Anyway we met a few of those characters at the front of the stadium before marching in to watch the Reds beat the Cardinals 6 to 2. Friday morning I arose and traveled back to Muncie to finish my final project for my J315 Media Editing class. And that's all I have to say about that. That night I watch a bit of the Greece football match on the tele before going to the rehearsal and rehearsal dinner of Mr. and Mrs. McMorrow to be, at the time. Saturday I woke up and spent the day as I do every other weekend at Reid Hospital scraping and washing trays and dishes and arguing baseball. At night I went to the wedding of Mr. and Mrs. McMorrow. Sunday I did the same thing as Saturday before NOT going to a wedding and instead heading up to Fountain City to have a father's day cookout with family. This was prior to seeing the commissioner of our league riding a bicycle.